ONEcount consolidates all customer touch points into a unified, identity-driven activation platform. With ONEcount out of the box integrated tools, you can develop cross-silo segments and create business rules that deploy across multiple tactics-instantly. Seamlessly integrate data from your website forms, ESP's, web content paywalls, internal databases, third-party data, event registrations, and more to trigger advertisements, e-mail marketing to specific audience segments based on user behavior or characteristics. Easily manage list segmentation with ONEcount's intelligent segmenting tools to add and remove users from audience segments based on rules you establish. Clients increase subscription revenue by consolidating visits across multiple devices and browsers. Previously users out-smarted a publisher's gating solution by using multiple accounts, browsers and devices. After clients have deployed ONEcount's platform with persistent ID technology, all user activities across devices and browsers were consolidated into a single, global profile-allowing the client to drive conversions faster. 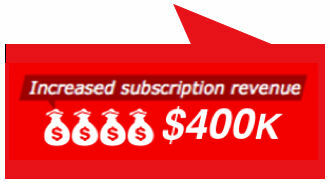 Users were pushed to the paywall quicker, increasing one publisher's subscription conversions by double digits.